At Virtual Strides, we host virtual races featuring different charities every calendar month. 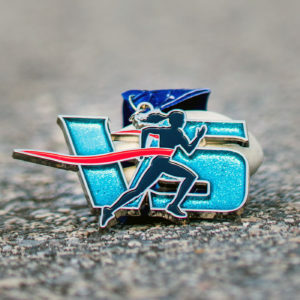 Read the details about our featured virtual races below, or jump straight to our Virtual Runs Store to see all of the unique virtual race medals currently available. New virtual races are posted here approximately two weeks before each event begins. 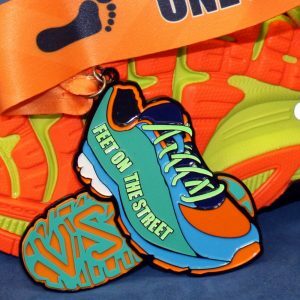 Be sure to check out our Past Virtual Runs too – Even though the original race periods are over, you can still register for all events that have medals left! 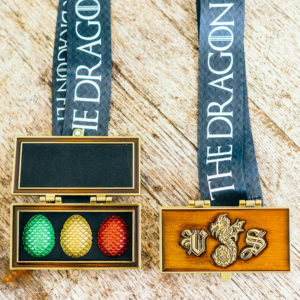 4/14 SHIPPING UPDATE: Orders containing The Dragon Within medals may not ship until late April. About this Virtual Run: There are nearly 6 million Americans living with Alzheimer’s disease today and by 2050, that number is projected to rise to over 14 million. Unleash your inner dragon and support the Alzheimer’s Foundation by participating the The Dragon Within virtual 5k/10k/Half Marathon. All participants will receive this incredible felt-lined treasure box medal – our heaviest ever! – containing three 3D dragon eggs. This medal is the perfect compliment to our Eyes of the Dragon and Bend the Knee medals (limited quantities of both remain). But wait, there’s more! 10 lucky participants will find three GOLD dragon eggs inside their medal, making them each the winner of a Virtual Strides prize package that includes a Virtual Strides medal hanger, a Virtual Strides t-shirt, and a $50 Gift Card! Winning medals will be randomly distributed to The Dragon Within virtual run participants throughout the race period. For complete contest rules and details, please read the Official Rules. Found three GOLD dragons eggs inside your medal? Fill out The Dragon Within Prize Claim Form by 11:59 p.m. EST on May 31, 2019 in order to claim your prize! About the Charity: The mission of the Alzheimer’s Foundation of America (AFA) is to provide support, services and education to individuals, families and caregivers affected by Alzheimer’s disease and related dementias nationwide, and fund research for better treatment and a cure. A portion of the proceeds from this virtual race (at least $5 from each registration) will be donated to the Alzheimer’s Foundation. For more information about this charity or to make a direct contribution, please visit alzfdn.org. The Alzheimer's Foundation of America logo is a registered trademark of the Alzheimer's Foundation of America Inc. and is used with permission. The use does not represent an endorsement by AFA. About this Virtual Run: Each year, between 140 and 160 law enforcement officers are killed in the line of duty, and their families and co-workers are left to cope with the tragic loss. Join Virtual Strides in remembering all those who have lost their lives in the line of duty, while raising money for a charity that provides resources to help those left behind rebuild their shattered lives. 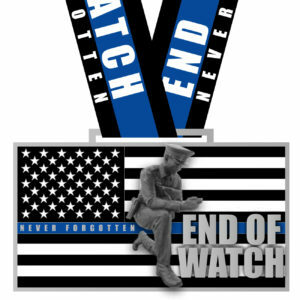 Register for a 5k, 10k, or half marathon distance and run or walk whenever and wherever you want to earn this 4″ commemorative End of Watch medal. About the Charity: Concerns of Police Survivor (C.O.P.S.) was organized in 1984 with 110 individual members. Today, C.O.P.S. membership is over 48,000 survivors., including spouses, children, parents, siblings, significant others, and co-workers of officers who have died in the line of duty. C.O.P.S. is governed by a national board of law enforcement survivors. C.O.P.S. has over 50 Chapters nationwide that work with survivors at the grass-roots level. C.O.P.S. knows that a survivor’s level of distress is directly affected by the agency’s response to the tragedy. C.O.P.S., therefore, offers training and assistance to law enforcement agencies nationwide on how to respond to the tragic loss of a member of the law enforcement profession. C.O.P.S. is a 501(c)(3) non-profit organization funded by grants and donations. A portion of the proceeds from this virtual race (at least $5 from each registration) will be donated to Concerns of Police Survivors. For more information about this charity or to make a direct contribution, please visit ConcernsOfPoliceSurvivors.org. Be sure to check out our Previous Virtual Runs – Even though the original dates for these virtual races have passed, if we still have medals available, you can still register and help the causes!